Pizza...who doesn't love it? Okay, I'm sure there are some haters out there, but perhaps it's because they've never had the chance to taste the "real thing": pizza as prepared in the city of its creation, and that is Naples, Italy. It's true that references to pizza and flatbreads with toppings have been found to date back to ancient times and in many different cultures. However, it was in Naples in the 18th century that tomatoes were added as toppings to traditional yeast-based flatbreads. Indeed, for centuries Europeans had believed tomatoes to be poisonousthe fruit was only brought back from the Americas in the 16th century! But in the poor areas of Naples that could afford little else, tomatoes were consumed regularly and their tomato-infused flatbreads became a sought-after specialty by those willing to risk traveling to the "slums" to taste it. 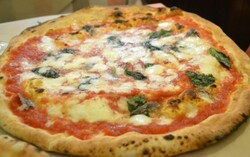 Image above: A traditional Pizza Margherita as prepared in Naples, Italy. All photos on this page are by the author, sockii, unless otherwise indicated. Speak of traditional--that is, Neapolitan--pizza, and you are most likely speaking of the Pizza Margherita: a simple yet perfect pizza featuring tomatoes, basil and mozzarella cheese. Legend has it that this combination was created in honor of Queen Margherita when she came to stay in Naples in 1889. The visit was meant to help ease tension still existing in the south after the unification of the Italian kingdom in 1861. Bored of the French food she was being served at the Capodimonte Palace, she summoned the most famous of Naples' pizza-makers of the time, Raffaele Esposito, to prepare three pies for her in the palace kitchen. Of the three, she did not care for the pizza marinara made with tomato sauce and garlic, nor the pizza napoli with anchovies. The one she loved was a pie that showed the colors of the Italian flag: red (tomatoes), white (mozzarella) and green (fresh basil). And so Esposito named the pie in her honor and the classic pizza was born. A real story, or just a fanciful legend? Some historians bring doubt upon such a quaint tale. But no matter the origins, the Margherita is still the standard by which all Neapolitan pies are judged. Have you ever had authentic Neapolitan pizza before? Yes, and in Naples Italy itself. The only place you can truly enjoy it! Neapolitan style, yes, but I've never been to Naples. You mean Papa Johns or Domino's doesn't count? What Makes for an "Authentic" Neapolitan Pizza? Italians take their food (and wine) seriously, often giving special recognition and labeling only to those products meeting strict traditional requirements. Pizza is no exception. The "Association of Verace Pizza Napoletana" (VPN) has set out guidelines that must be met for a pizzeria to display their logo and call itself a "true" Neapolitan pizzeria. These guidelines specify the composition of the pizza dough, how it must be risen, the type of cheese and tomatoes used in its toppings and other specifics as well. Despite such stringent guidelines, you will still find variations from one pizzeria to the next. People are passionate about which pizzeria in Naples they consider the best, but as long as you look for the "Vera Pizza" sign you should be able to enjoy a delicious, Neapolitan-style pizza in the city. Here you can see a master pizza maker at "Il Pizzaiolo del Presidente" in Naples preparing a typical Neapolitan pie. Notice how artfully he handles the dough—and how the pie itself only cooks for 60 seconds in their incredibly hot oven! The strict guidelines on the use of fresh, regional ingredients, handling of the dough, and the high heat ovens make for a truly unique and delicious pizza experience. The first thing you notice about a Neapolitan pizza is the crust: it is slightly soft and puffy on the outside yet very thin in the middle. There should be no rubbery "chewiness" like you get in an inferior, thicker-crust pizza, nor is it as cracker-thin and crisp as, say, the pizzas served in Rome. Lift the pie and you should see a nice char on the bottom from the hot oven, but not so much that it tastes burnt. The sauce or tomatoes on a Neapolitan pie should be simple and fresh, with very minimal spices. Quite often it is just crushed tomatoes, olive oil and basil, although some varieties may also include a little oregano, garlic or hot pepper. There is none of that sugary-sweet, pureed sauce you find on so many cheap American pizzas! Toppings, too, are not over-applied. There should be just enough cheese to flavor every bite yet also allow the tomato flavor to shine though (unless you are ordering a white pizza). Beyond that, of course, are ingredients and characteristics perhaps far less tangible. Is it something in the local water used for the dough? (Many say that is also why New York pizza is so good—and indeed, the closest to Neapolitan in the United States.) Is it the age and "seasoning" of the pizza ovens? Is it the traditions and skills passed on for generations? Who is to say for sure. Just go, eat and enjoy! 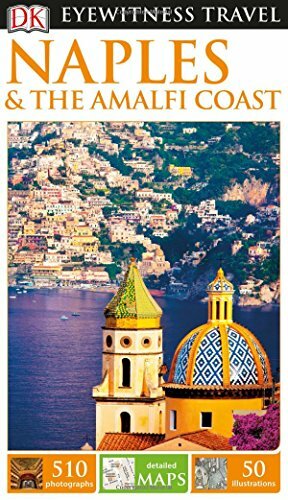 Whether you want to get a taste for the cuisine of the region before you travel or wish to learn to prepare it at home, these books will provide lots of droolworthy inspiration! Believed to be THE first pizzeria in the entire world, open since 1830. Their pizza oven is lined with lava rocks from Mount Vesuvius, and four classic pizza varieties are offered along with a full a la carte menu. Opened in 1870, there are only two offerings on the menu: Pizza Margerita or Pizza Marinara. Many say it is perhaps the best pizza in the entire world...you'll never know until you try for yourself! Claims to be the inventor of the original Pizza Margherita in 1889. The real deal or now a tourist trap? Reviews are divided, but you may have to dine there yourself to decide! Here you can try a number of different styles of pizza including a local specialty of "fried pizza". This is a pizzeria we ended up dining in several times as we absolutely loved their pies. A nice variety of toppings from traditional to more unique, huge sizes and delicious for a great price. Started in 1921 in Naples, Vesi now has locations in Rome as well. We enjoyed our meal here where they have many different styles of pizza available. Neapolitan pies are meant to be eaten with a knife and fork! Do not expect your pie to come out pre-sliced in wedges for you. The thin crust and often "wet" middle make it difficult to pick up and eat anyway. If you find a typical Margherita pizza too "soupy" in the middle for your tastes, try ordering one made with buffalo mozzarella instead of regular cow's milk mozzarella. Mozzarella di bufala tends to have a firmer texture that does not give off as much water in cooking (and personally I prefer the flavor anyway). Most Neapolitan pies are meant to be single-servings—that is, everyone at a table orders their own. If you're not that hungry (the pies do tend to be pretty big) you can of course share, but if you're eating at a sit-down pizzeria you should likely order some side plates (fried croquettes and arancini are popular) to go along with the meal. Pizza is generally a very cheap meal in Naples, making it a great choice for families with young children or anyone on a budget. Most single-serving pizzas should not cost more than €3.00 - €7.00 for a basic Margherita or Marinara, only more depending on the use of special ingredients such as seafood or cured meats. With a beer or some wine you can easily eat for no more than €10.00 a person, often even cheaper than that. 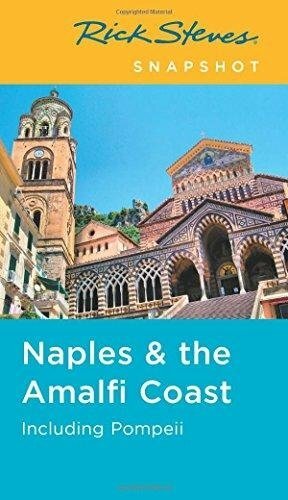 Planning a Trip to Naples? The author, sweetie, and one of the wonderful pizza-makers of Naples. For More of my Food Articles and Travelogs, Check Out South Jersey Foodie! At South Jersey Foodie you can find my personal recipes, restaurant reviews, and also reports from my travels all around Italy - including my weeks in Rome, Naples and Salerno in 2014. Yeah I've had a real Napolitan pizza in Naples thirty years ago and yet to this day I don't like pizzas. It's one of those meals I don't eat at all, unless I'm in despair for something to eat (you know, when you find dead mice in the kitchen cabinets, you know you MUST go shopping, hehe). But indeed, the Napolitan pizza I ate was the most delightful I've ever had. It remains one of those memories from my Italian tour. My son, instead is fond of pizzas and would eat one each day if I'd let him do so.